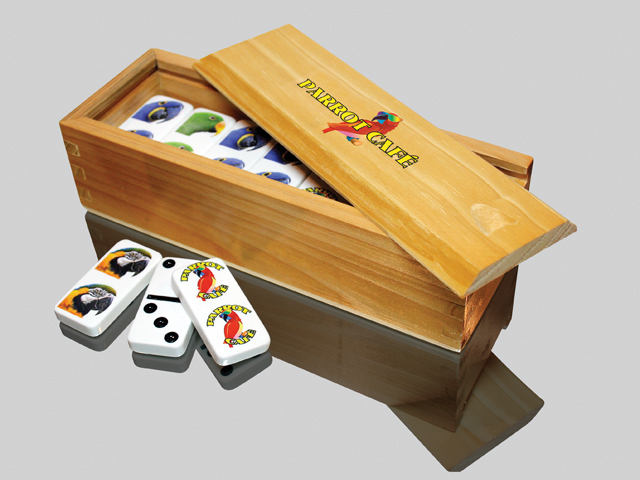 Our Custom Imprinted Dominoes Sets feature your design custom printed on the top of the Wooden Dominoes Case. Each Dominoes Set includes 28 Double Six Domino Tiles that come securely packaged in a stylish Wooden Box that showcases your logo/design. These Custom Dominoes Sets make a great promotional giveaway, and they are also ideal for retail stores. Each Wood Domino Box measures 2¾" wide x 7¾" long x 1-7/8" high. The individual Domino Tiles are 1-15/16" x 1" x 5/16". •Wood Box: 4" x 1½"